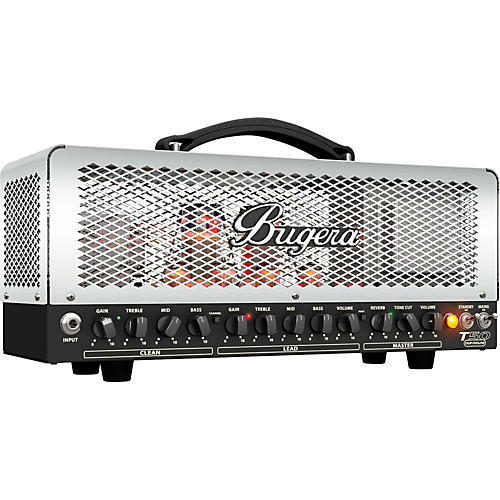 Great rock tone with plenty of tube power. When you think of classic British rock, the sound is undeniable. It’s the stuff dreams are made of, that sweet clean-crunch that spawned a generation of legendary players and the music that has stood the test of time. We packed all that iconic tone, and all the edgy character of a modern high-gain amp into a small, but powerful package – the T50 INFINIUM! We added a no-compromise post-phase-splitter, dual-VR Master Volume that lets you attenuate the signal right before the power tubes for full harmonic content at any level, and a huge output transformer for increased dynamic response and clarity. With four 12AX7 tubes and two EL34 power tubes, the T50 is capable of covering vast sonic territories with remarkable ease. A true 2-channel amplifier, the Clean and Lead channels are completely independent, and each has its own custom-tailored 3-band tone stack (Treble/Mid/Bass) for the ultimate in tone shaping. The T50’s push-pull power section delivers 50 Watts of solid rock ‘n’ roll and features our revolutionary INFINIUM Tube Life Multiplier Technology – which not only controls your output tubes’ status, but can extend their lifespan by up to 20 times. The T50 INFINIUM also includes switchable Class-A and Class-AB operation, allowing you to choose Class-A for vintage silkiness, or Class AB for its raw and highly responsive power. It's topped off with a sweet-sounding, high-definition Reverb that lends an air of timelessness to your solo and rhythm parts, and a Phat switch to boost the sound character of your guitar playing even more. It all adds up to an all-tube amplifier with massive stage presence and unbridled versatility – the incredible T50 INFINIUM!